I recently broke up with Google Reader and switched to a new blog reader called Bloglovin’. For those of you who aren’t familiar with blog readers, they aggregate the latest posts from a person’s website subscriptions into one long email or web-based article. This makes blog reading less laborious and more discreet which, I understand, is completely necessary for those who enjoy a little blog-reading while on the clock at work. If you’re an avid blog reader, you’re probably familiar with Google Reader. 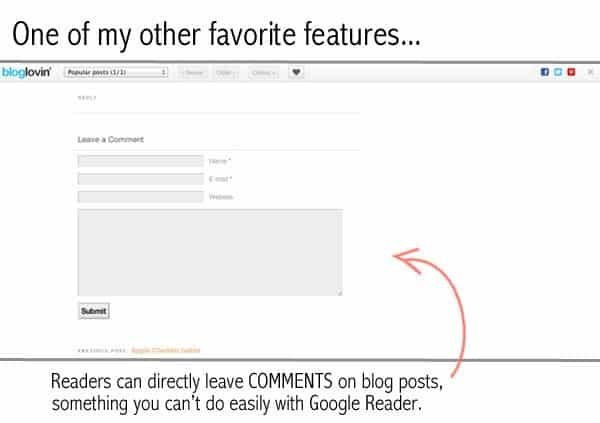 If you’re an avid blog reader and a blogger, you probably have a love/hate relationship with Google Reader. While it’s great for catching up on the 1,384 new posts you have yet to read, it also cheats your own blog out of page views. Lost page views means lost revenue since the reader’s eyeballs never actually hit your page and see advertisements displayed in the sidebar. It gives bloggers page views. I can comment directly on posts. I put together a quick tutorial to show you the best features of this reader & why I won’t be going back to Google. Below is a snapshot of the main page. Once you’ve created an account you can search for and follow your favorite blogs, categorize them however you like and read all unread posts either by date posted, category or blog name. One feature I like is being able to scroll through snapshots of posts from the main page. As I mentioned before, the best part of Bloglovin’, from a blogger’s point-of-view, is that it brings viewers to your page which counts as a page view. Page views = profits from advertisers, something you don’t get from other readers. Another thing I love about Bloglovin’ is that viewers can comment on posts directly since they’re already seeing the post from your blog. No more having to click through from a reader to comment. I can tell you I comment on way more blogs now that I use Bloglovin’, which I hear is also good way to get exposure for your own blog if you have one! HOWEVER, Google Reader has recently stopped allowing you to download the necessary OPML file with all of your subscriptions. If any of you can figure out how to get your subscriptions into OPML format, let me know in the comments! For you Google Reader users, it might be easiest to manually search and add blogs – a few at a time of course. See the first tutorial image for the search box location. If you use another reader, you should be able to figure out how to get that OPML file and import it. UPDATE: Rachel figured out how to import from Google Reader! 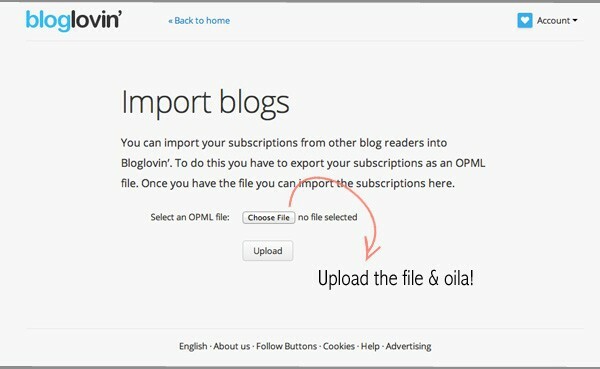 “I just used the Takeout export on Google Reader and saved it as a xml file and then imported to Bloglovin.” Thanks for sharing this, Rachel! Good content is important but a big part of what I love about reading blogs are the visual aesthetics – the unique layout, colors and fonts that make up the experience of reading a blog. 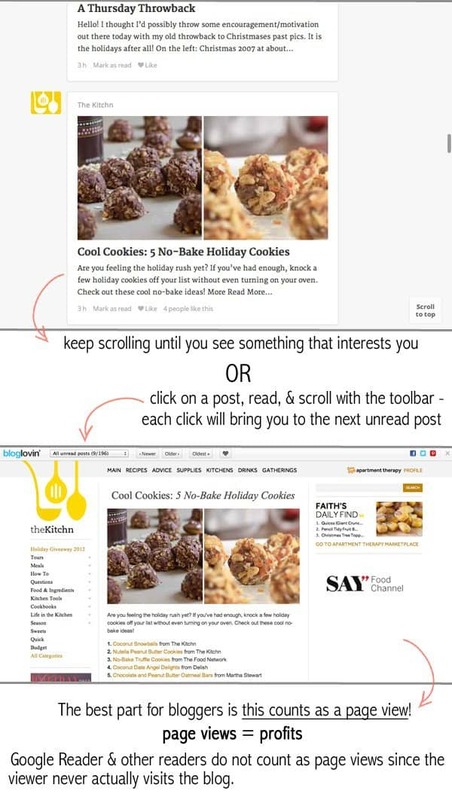 These are all lost with other readers which displays posts in an email-type format. This is the main reason I initially made the switch. It takes a little bit of getting used to but now that I have my full list of blogs added, I’ll never go back. Hopefully this tutorial was helpful! Questions of the day: What readers do you use? Do you read blogs purely for the content or for the overall experience of visiting the website too? PS. How to claim your blog on Bloglovin’ (first link). PPS. You can follow me here – post your link below and I’ll follow back if I don’t already! I have a Bloglovin’ account and it automatically adds my new posts. I didn’t realize that Bloglovin’ gives you page views. I’m still trying to figure out the ins and outs of it but this tutorial is definitely helping :) Thanks for sharing!! Thanks for such a useful post. I still haven’t figured out the answer to my issues with posting comments, so if anyone has the answer I’d love to hear it although this blog gives me the ability to fill in my info instead of the crazy drop down that doesn’t work :-). Just started using Bloglovin’ recently – love the way it looks so much! Hi!! I’m so glad I found this post. Bloglovin is a platform that is, for some reason, very confusing to me. Do you know of a post that talks more about how you can comment right from bloglovin? Like for instance, I clicked on your page from bloglovin so that I could read the post. Now I would like to favorite your post but I already scrolled past in on bloglovin and I can’t find it. Is there an easier way to comment and save posts? I like the way you can comment on your blog but some ask me to sign into disqus and that opens up another segment, and I’m not sure if I want to be in that for my sanity lol. Thank you!! My question is.. Do you have advice for how to get more followers on this platform? I post a lot of (what I think is ) great content but I’m not sure how people are supposed to find my site organically. When they are on my site, I don’t think there is much of an incentive to follow on Bloglovin’ if you’re not already on it. I try to ask for follows on BL every few posts and don’t want to do any giveaways. Any advice? Thankyou for this bloglovin tutorial. So glad that I found your blog. The recipes look amazing. I look forward to reading more! Do you need a bloglovin’ account to view blogs or blog posts? Great info as bloglovin is now growing to replace many old readers. I added it a while back into my blog. So far so good. Thanks. We appreciate you sharing exceptional informations. Your website is very cool. I’m stunned at the details which you’ve put on this site. for more articles. You, my friend, ROCK! I found simply the information I already searched in all places and simply couldn’t run into. also have you book-marked to see new stuff on your web site. This was a very helpful post. I know it’s almost a year old but you were very smart to change RSS tools before Google Reader shut down. This one is an inspiration personally to uncover out much more associated to this subject. I have to confess your data prolonged my sentiments as well as I’m going to right now take your feed to stay up to date on each coming weblog posts you would possibly possibly create. You might be worthy of thanks for a job completely performed! What a great post!! Thank you for sharing! Problem solved. It was my background theme. The RSS was fine, but the theme confused the update. Quick question: when I click on post a comment to post to a blog, nothing happens. Could this be a blogger within bloglovin issue? You mentioned that posting a comment without having to link out to the blog is one of your favorite features, but I can’t figure out how. Thanks so much for this post and your help! This is such a great comprehensive post about BlogLovin! I also like it because of the iPhone app– so nice when you are on the go! thank you so so much for this incredible tutorial! it really inspired me in writing one for my blog. i have a lot of people that read my blog who are not typical blog readers, so i hope i was able to help them see why they need a reader. Great post! Makes me want to move to Bloglovin’ too! I’ve discovered it last December when you wrote the post and so far I’m lovin’ it! I just followed your blog come follow mine on bloglovin’ http://www.bloglovin.com/frame?blog=3790535&group=0&frame_type=a&link=aHR0cDovL2xpc2EtbmFnZWwuYmxvZ3Nwb3QuY29tLw&frame=1&click=0&user=0! Adorable blog. I most certainly will! I have the same problem as Pam C wrote about on 13th May. And I know that several other people are having the same problem too. Were you able to help Pam? I’m going to be looking for a different reader if I can’t find out the answer to this. I had the same frustration too! Liking in Bloglovin will bookmark it within Bloglovin – just view liked posts. Inevitably though I’d end up going directly to the blog, clicking on the post and bookmarking that way. How did you go directly to the blog? I usually have to do a search. I tried hitting ‘home’ but it still gave me the bloglovin address. I do use the ‘like’ but if I want to print something and post the address, it will still give me the bloglovin address which is way too long. Thanks for your comments! I manually type the web address for the blog in a new tab (i.e. nutritionella.com). Total pain, I know! Building traffic should also be easier with bloglovin’s great search features. Now you can narrow searches by areas of interest so since I blog DIY projects, I don’t have to hit all the foodie blogs, mommy blogs, etc. while looking for fun new projects, and my readers will find it easier to find me! Thanks for this helpful post!! I notice in bloglovin that I have trouble making comments on other’s blogs or entering contests that they may have. Is this a settings problems on their blog or something I am doing wrong? Bloglovin will not respond to my inquiries of how to solve this problem. I use Bloglovin and love it. I have used others, but like Bloglovin so much better. I like how I can sort the blogs. By the way I have been following you for a while now. Love your blog. You are lucky to be living where the famous Nike Women’s Marathon takes place. I have run the half but I want to run the full someday! Thanks for this post! Someone linked to it on Twitter so I immediately headed over. After reading this, I’ve signed up for BL and I’m feeling okay about losing GR now. I had no idea that BL views count as pageviews, or that you could comment right from BL. Plus it’s pretty! Guess I can stop panicking over losing GR now. My poor husband thanks you haha. Thanks for the info! I will be switching! THANK YOU for posting this! Google Reader was my main reader and Bloglovin was a back up, but now that Google Reader is going away, I just imported everything to Bloglovin! This was SO helpful!! Thank you for this! I saw a link to your post in my twitter feed this morning, and you saved me much time and energy. And I think I actually prefer it to Google Reader, so all is good. I hope San Fran works out great for you! Thanks for the tutorial! I’m so mad at stupid, stupid Google. For as much help as they provide, they sure do screw things up for me lately! Bloglovin’ looks like a good alternative. Have all my subscriptions imported but wish I could import my categories too! It’s taking me quite a while to categorize the almost 500 blogs to which I currently subscribe. hmph. I’m definitely going to check into this. Thanks for the post! I love, love, love Bloglovin’ for all the reasons you posted and more! I made the switch from Google Reader a few months ago and haven’t regretted it for a second. The blog aesthetics are really key for me, and Bloglovin’s UI and everything are just a lot nicer too. Thanks or this post! This really makes it easy to see why Blog Lovin is preferred as a reader for bloggers anyway. So love that it gives you page views! GREAT tutorial, lady! I love this. I actually haven’t been active on a Reader for a LONG time, given the amount of blogs I follow and exhausting it becomes. I’m going to start using BlogLovin’ more. Way more aesthetically pleasing and I love the functionality. Here’s my link! http://www.bloglovin.com/en/blog/2529306/chef-katelyn/follow xo love! I am a little confused on whether views in bloglovin count as pageviews. It still shows a bloglovin URL so is it counting as a pageview for the site? It does! Bloglovin is just a referrer despite the URL. Wonderful tutorial! Just signed up and followed you! Thank you for this! 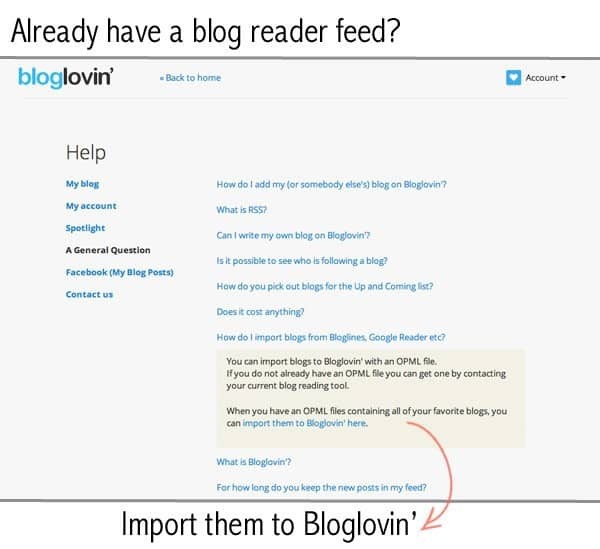 I had no idea about bloglovin but use Reader all the time. Love that I would be able to comment directly instead of having to click through! Will be checking this out. Oh wow, this is great. I shared it and I hope more people switch to bloglovin’ too! I use it and Google Reader but I think I’ll be making the switch too. It’s only fair. I made the switch today. And love love LOVE it!! Took me a little to get onto it, I really like the asthetics. Beautiful. You convinved me too! 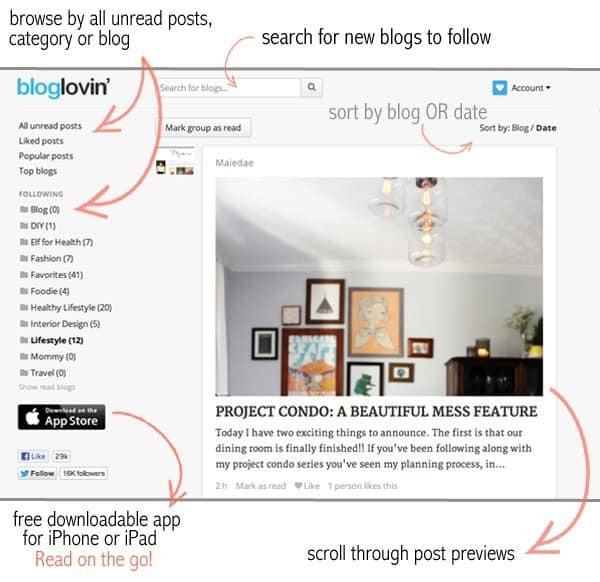 I love the interface for Bloglovin’ and agree its much better that Google Reader. Thanks Elle! Omg what a great idea! I’m going to have to check it out. Just found your blog and I am in love with it, by the way :) Keep up the good work! I really am going to have to take a look at this. I don’t even use google reader, well I signed up for it, but never ended up using it. Besides page views is always a big plus!! Hopefully an Android version will come soon and I can jump ship, though. Thanks for the tutorial! great tutorial! totally making the switch! I’ve used it and it works great! A love/hate thing pretty much perfectly sums up how I feel about Google Reader. I got all my google reader subscriptions to transfer over! I just used the takeout export on google reader and saved it as a xml file and then imported to blog lovin. I’m excited to give this reader a try and compare to google reader. Thanks for the great post! That worked for me – thanks, Rachel! Where is that function in Google reader? You’ve convinced me to switch! I had no idea what readers were in the first place – this one seems awesome! I agree though, a big part of why I love reading blogs is because of how they look in addition to how they read. I’ll definitely be signing up for an account. Thanks for the tutorial, Elle! I use google reader but open them up individually in new windows so the page views count. Looks like i can rely on Bloglovin to do that now!